Since its inception as a haven for senior horses, Traveller’s Rest Equine Elders Sanctuary has welcomed most forms of healing, including allopathic and homeopathic treatments, spiritual work, energy work and body work. Our goal is to use whatever modality or combination of modalities works best to help each resident,as an individual with specific needs and a unique history, overcome physical and emotional challenges. In an effort to construct a holistic care regimen for every horse, no form of healing is ruled out just because it falls into a certain category. “Holistic,” to us, means looking at the big picture – how all aspects of horse care work together to build a whole. No one factor can be isolated or changed without affecting the other parts of the whole. TREES’ definition of holistic care means that all aspects of the horses’ lives and well-being are taken into consideration. In evaluating each horse’s care, we look at physical, emotional, and social factors, including everything from nutrition and housing to stress factors and integration into compatible social groups. Formulating a management style for one horse may include pharmaceutical remedies while another horse may do best with “hands-on” body work, or “hands-off” energy work. When referring to holistic care, we do not exclude any modality simply because it is not labeled “natural” and never assume a “one size fits all” position. 1.--Respect the animal. Do not force a session of any kind if a horse is clearly upset by, or uncomfortable with, the idea. Consider history, physical conditions, emotional idiosyncrasies, and personal preferences. Horses in general may not be comfortable with modalities involving large or sudden arm motions. Horses with physical abuse in their pasts may be particularly upset. Some horses have physical conditions like Lyme Disease that cause overreaction to seemingly “normal” stimuli, including touch or sound. Other horses may have had little contact with humans and view people as predators. 2.--Do not focus on or draw attention to past trauma or unpleasant physical appearance unless the animal wants to communicate something to you about those issues.Horses are very intuitive. Your discomfort will make them uncomfortable. If you feel unable to calm yourself before working with a particular type of situation, first take some time to quiet your mind or work with another animal until you feel able to return to a difficult case. 3.—Try not to impose expectations on how a session should proceed, how long it should last, or how it might end. The results may not be what you want, but may be what is right for that animal at that time. Trying to force a session of any type into a preconceived mold could lead to discomfort and disappointment for both animal and practitioner, and be of no benefit. We are not necessarily trying to “cure” every illness or issue, but to help the animals achieve the highest quality of life possible given each one’s unique circumstances. 4.--Do not diagnose. During your sessions you may detect aches and pains, stiffness, or other physical sensations. Please relay those discoveries to caregivers, but do not try to interpret them or determine a specific cause. Please respect that TREES’ caregivers will make every effort to choose the best course of action for any animal based on a combination of practitioner input and advice from licensed veterinarians and other equine health care professionals. 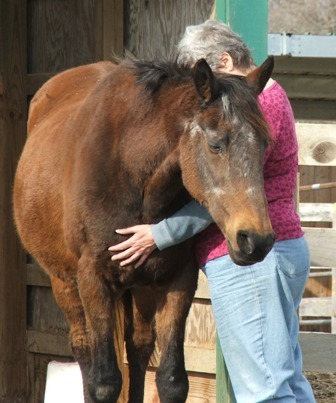 5.--Because Traveller’s Rest specializes in caring for elderly horses, we are often confronted with “end of life” issues. Our goal in these instances is not to try to “fix” the horses, but to support them as they approach the end of this life. We must also take care to not project our wishes on them. 6.—When in doubt, take the conservative route. Many of TREES’ residents have been living with certain conditions for years, if not decades, and sudden drastic changes may cause discomfort or anxiety. Better slowly and steadily than quickly but backwards. 7.--Keep yourself and others safe. Please follow safe procedures when handling horses. See TREES’ “Basic Farm Rules” for more specific information. If, for any reason at all, you are not comfortable working “hands on” with a particular horse, use a “hands-off” or distant technique. If you are nervous, the horse will respond in kind and a nervous prey animal can be dangerous, however unintentional. 8.—While at TREES, please respect other modalities and other practitioners. If an opportunity arises, take a moment to teach others about your chosen modalities while not forcing your preferences on them. 9.—Finally, be open to learning from the horses. Accept the give-and-take nature of healing. It’s rarely a one-way street. TREES welcomes practitioners of all healing modalities willing to work within our guidelines and further our vision for the sanctuary. Please email info@equineelders.org or call 540-972-0936 for more information.